A humorous song sung by Nicole Kidman in Moulan Rouge says that men can be expected to grow cold when girls become old and shapeless, but diamonds are a girl’s best friend. For centuries, women have had a fondness for this sparkler, though their reasons for this would probably veer towards the sentimental rather than the mercenary. Because a diamond is one of the hardest substances known to man, it is expected to last forever – unlike the fickle affections of men. It is not surprising, then, why many couples choose the diamond as the center gem in their engagement rings. Apart from its sturdiness, the diamond also has a potential for brilliance unequaled by other precious stones. A well cut diamond captures light and turns it to pure fire – especially when the setting allows it to do so. 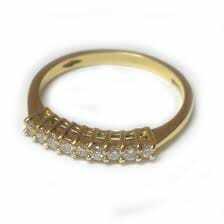 For this reason, through the decades men and women have spent a lot of time, money, and effort to choose just the right ring style to provide the perfect home for the perfect friend. 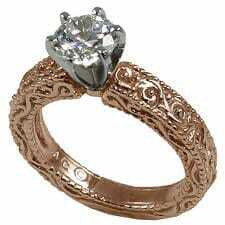 Diamond engagement rings have a history that goes back to the Middle Ages when they were used to represent undying love. 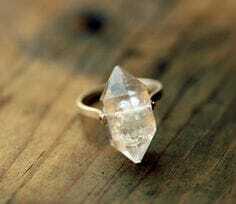 The first recorded diamond engagement ring was given by Archduke Maximilian of Austria to Mary of Burgundy in 1477. During the Renaissance, diamonds flourished as the preferred stone for engagement rings because of the discovery of new mines and the improvement of cutting and polishing methods. By the nineteenth century, jewelers popularized most of the basic styles for diamond rings, as we know them today. Some diamond engagement ring styles have been around for over a hundred years. Many of the ring designs today are merely variations of motifs that first became popular in the nineteenth century. Among the most enduring traditional ring designs are the half hoop, the three-stone diamond ring, and the gypsy ring. New versions of these styles invariably make an appearance each time a new way of cutting diamonds is discovered, or a new trend catches on. This is especially true in the case of the ”gypsy ring”, frequently referred to as a flush setting today in deference to the call for politically correct terms. The tried and tested traditional setting is ideal for the girl who likes classic designs. This is the best choice for a woman who is not given to flights of fancy, and who likes the predictability of a well-ordered life. Vintage engagement rings are gaining popularity today for many reasons. First, a good vintage ring has good potential for becoming an heirloom. Second, it is considered more ecologically friendly to maximize the use of metals that were extracted from the earth long ago. A third reason is that many people simply like the look of vintage rings. These rings are perceived to have more character than modern designs, and there is something noble about the way they have endured. Considered vintage are rings that were made during a distinct era. Rings way over a hundred years old are technically considered antique rings, and these fall under an altogether different category. Rings made in Art Deco style from the 1920’s to the 1930’s qualify as vintage rings. For that matter, even rings made from 1935 to 1950 can be referred to as vintage if crafted in the style of that period. Likewise, diamond rings from the 1940’s to 1960’s, done in the distinctive bold style of that age, would do very well as vintage engagement rings even if they are relatively new. Now, not everyone has the good fortune to acquire a genuine vintage ring. For those who really want the vintage look but cannot afford a ring that comes from a vintage period, an alternative direction might be to buy rings made in vintage style. Some jewelry shops do carry styles that are reminiscent of the ‘good old days’. 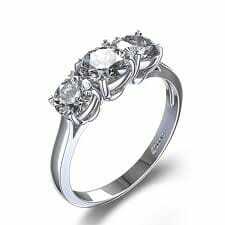 The good news is, there is a lot of material to copy from if couples want the more recent editions of vintage style rings. For example, the designs of Picasso and Salvador Dali from the sixties have all been immortalized in countless pictures and magazines. A girl who respects history and likes to preserve connections with the past would do well to choose a vintage ring as the setting for her diamond. The nice thing about choosing a vintage ring is that there is a wide variety of styles to choose from so no matter what a bride-to-be’s personal preference is, there is sure to be a vintage ring just for her. Technology has certainly done a lot to change the way rings are made. It has also allowed jewelers to experiment with designs that were not viable in the past. Today, an abundance of designs makes it possible for modern women to choose their perfect diamond engagement rings. Some go for elaborate pieces redolent of the Victorian era, while others opt for the starkly simple styles like the much loved Tiffany solitaire. Some settings have become popular today because improved technology has made them possible. 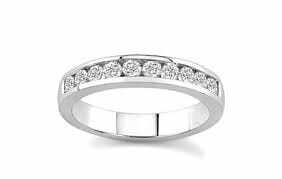 This particularly holds true for variants of the half loop design, which can now be made by inserting diamonds between two bands without the use of prongs. This style, called Channel style, results in a smooth ring where the girdle of the stones is protected. 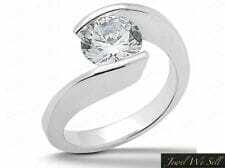 Another modern design is the Tension setting, which uses pressure to fasten a diamond between the ends of a metal mounting so that the stone looks like it is floating. The Bezel type setting is another setting that has become perfected because of improved technology. This setting places a metal frame around the diamond, making the stone look bigger. Like the Channel setting, this style protects the edge of the stone, and the metal frame ensures there is less risk of snagging. 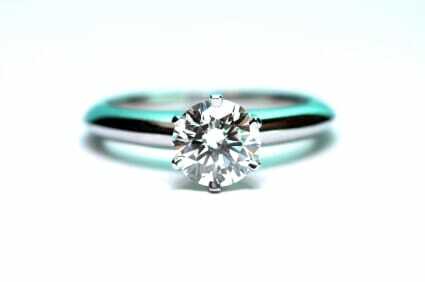 The classic Tiffany solitaire is a creation that has not waned in popularity since it was first introduced to the public. This features a six-prong arrangement that elevates the center stone way above the ring’s band. It is an arrangement that gives the ring a sleek, uncluttered appearance. It also allows the diamond to capture the maximum amount of light possible. This adds considerably to the stone’s sparkle. As far as engagement rings are concerned, 2013 is the time when a woman can wear the engagement ring she wants without having to conform to tradition. Not everyone wants to wear a cluster of diamonds, or a stone surrounded by tiny gems. At this point in the history of engagement rings, the only rings women cannot wear are those her fiancé cannot afford to give her. Otherwise, the sky is the limit! The good news for the bride-to-be whose tastes run to the overwhelming is that people now are learning to be tolerant of the unusual. Choosing the perfect setting for her engagement ring is one of the things that a girl has to do carefully because the ring she gets will hopefully be with her for a long, long time. She will want to make sure she picks a setting that will stand up to housework and all the things that need to get done day after day. As a whole, it is wiser to choose a ring that requires little maintenance instead of one with features that need to be checked every now and then. 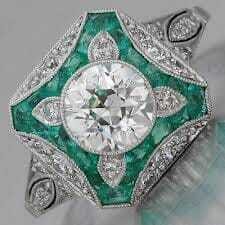 In addition to that, it is a definite plus when a girl gets a ring that will go well with the rest of her wardrobe. Finally, if diamonds are indeed a girl’s best friend, then the most important diamond in a girl’s life should be safely ensconced in a setting that can weather the years with grace. She should pick a setting she will be happy with even after various trends have come and gone. Like friendship, the setting for an engagement ring is meant to last.